Defender Stainless Steel Lock Blade Folding Pocket Knife, Made in Japan. A great Lock Back type Folding Pocket Knife, with Stainless Steel Blade, approximately 5 1/2" Long when Closed, with a 3 1/2" Blade. The Handles are Composition, Black, and has Finger Grips. Doesn't seem to have ever been used. 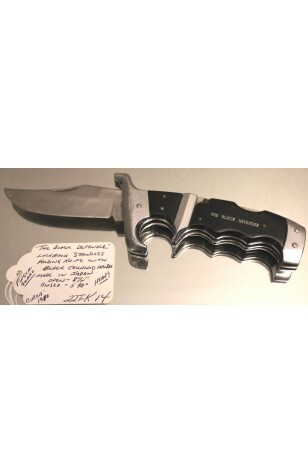 A great Lock Back type Folding Pocket Knife, with Stainless Steel Blade, approximately 5 1/2" Long when Closed, with a 3 1/2" Blade. The Handles are Composition, Black, and has Finger Grips. Very Good Resale Condition, doesn't seem to have ever been used..